Hi all – We know it’s been awhile since we’ve updated our blog. Over the last few weeks Sally has been undergoing several tests that would allow us to see the state of her health and have a baseline post treatment should any issues arise in the coming weeks, months or years. We planned to share those results in a post, however over the last few weeks we started to see some abnormal behavior from Sally that had us concerned. 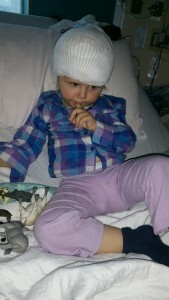 This culminated with Sally having an EEG done this week and determining that she is suffering from myoclonic seizures. Here is a video that shows the behavior we’ve been seeing that we created for the doctors: Click here to view video. The “jerks” you see in the video have been worsening to the point where last weekend Sally fell off her slide after suffering one and became disoriented. The jerks can be so intense that she almost falls off her chair. We were equally becoming concerned about her getting hurt, especially knowing she has weakened bones from the cancer treatment. On Tuesday night Sally was admitted into Weill Cornell NYP Hospital across the street from Sloan-Kettering for an overnight EEG. 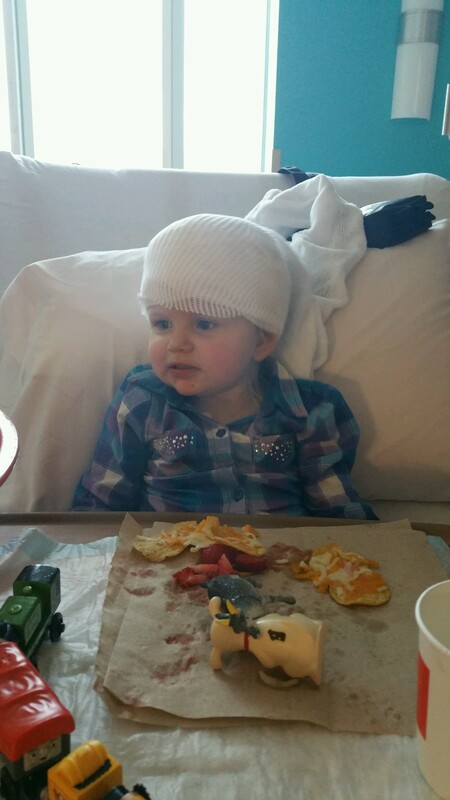 We were concerned that the “jerks” wouldn’t happen and we’d be left with no answers, however by the next morning our doctor informed us that Sally had many abnormalities in her EEG, and was surprised she looked as well as she did based on the results. 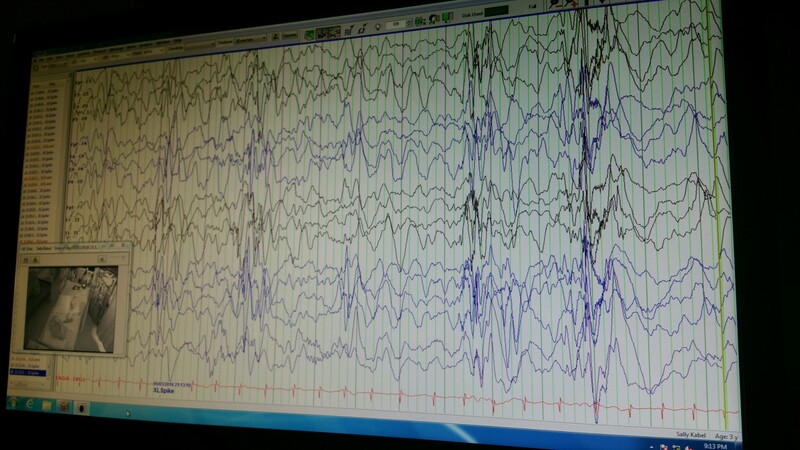 Hooked up to the EEG. 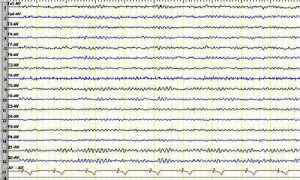 Below are two EEGs. 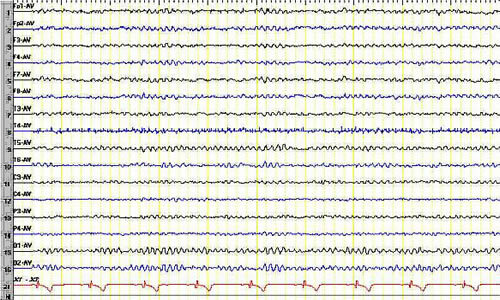 The first is what a standard night-time EEG should look like. The second is Sally’s, which is clearly abnormal. All the terminology is still new, but her spikes were stronger and even persisted in the left occipital lobe after the Valium (more on that below). 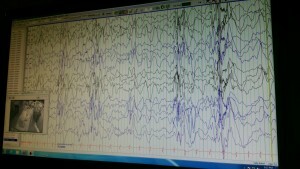 Sally’s sleeping EEG with “events” and “spikes” showing abnormalities. Left untreated, this could become damaging. The seizures fall under the category of epileptic encephalopathy. As a first step it was decided that Sally would need to be given the largest dose possible of Valium, enough that they had to put an IV in should Sally’s lungs stop from it. This had to be done as it would give them a definitive answer as to whether the med would help Sally’s EEG improve. The med did improve Sally’s EEG, but not entirely. However it was decided that as a first step she would be put on Onfi at a low dose and increase the dosage every 5 days to allow her body to adjust to it. The biggest downside to this medication so far is that it makes Sally…well…drunk. She babbles, is groggy and has a hard time walking. We’re told her body should get used to it over time, hopefully. Although this will hopefully improve the EEG, there is only a 30% chance it will stop the myoclonic jerks themselves. Not odds we like to hear, but odds we are accustomed to. With that temporary solve Sally was released last night, however we have a long road ahead of us. Our next step is to choose a specialist for Sally to see, a big decision that we liken to when we had to choose a hospital to treat her leukemia when she was first diagnosed. Like with Dr. Steinherz, we want the best for Sally as she is such a unique case. We also want somebody who has an understanding of the effects of cancer treatment on the brain, and is open to alternative treatments. It’s a big decision and we’re weighing the options. Following that, Sally will need to undergo a follow up EEG in 5 weeks. Beyond that, we don’t know much more so we’ll have to wait and see. To say this opens old wounds for us is an understatement, and am sure most reading this understand. It was hard on all of us this week, especially the boys who grow nervous whenever Sally is in the hospital and can sense our concern. We’re staying positive and hoping for the best, but as always planning for the worst and trying to get educated. 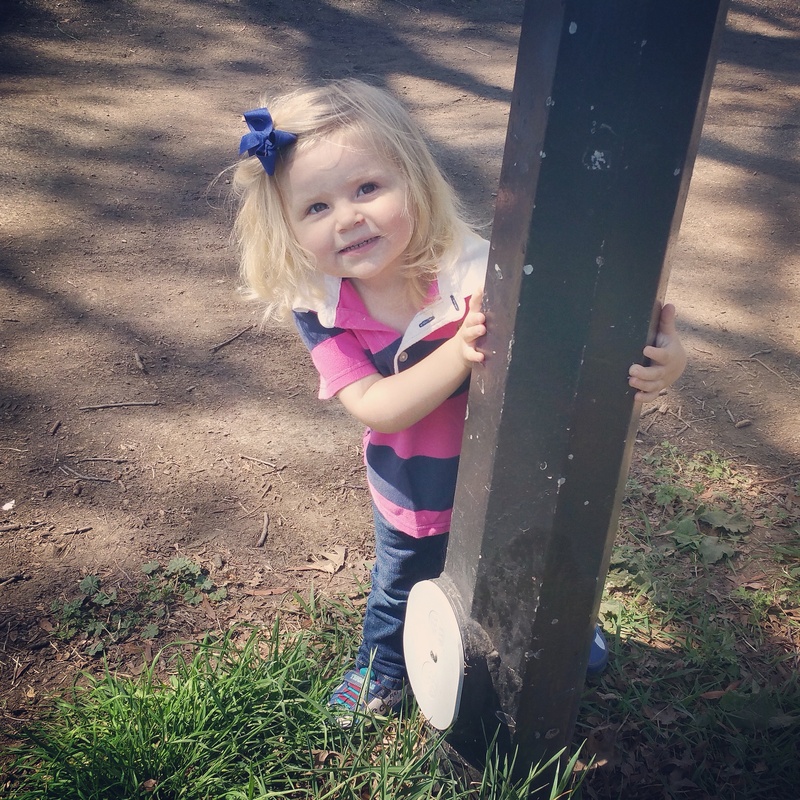 Initially doctors have told us that they don’t think the seizures are related to the cancer treatment, however speaking with other infant leukemic parents we were surprised to learn of other kids who have also had seizures post treatment. It’s something we’re exploring. Outside of that, Sally has been making improvements and most tests to date have had positive results. She’s eating more by mouth the last few weeks. She still loves her broccoli, eggs and strawberries, but is more open to other foods now. She can eat half an apple on her own, and really likes pizza (what Brooklyn girl doesn’t?) We still do some feeds via her feeding tube, but mostly just at night. We also continue to use her tube for her various meds. Eating an apple with intensity. 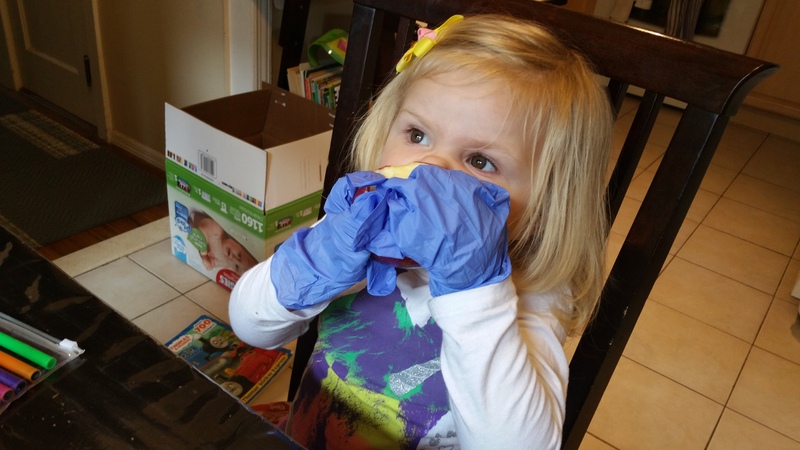 Wearing rubber gloves. She had an endoscopy/colonoscopy done, and to our relief her digestive system is mostly in a good place except for some inflammation in her esophagus and erosion in her stomach lining, likely from the treatment. We’re told that this should heal over time. Today Sally met with an endocrinologist to discuss her bone mass after undergoing a bone density scan a few weeks ago. Although her density in some areas is on the low side it overall shows improvement. The specialist said that since Sally has not had any recent fractures (knock on wood) and has been growing, he said to wait and let her body continue to grow and strengthen naturally. He asked us to come back in 6 months. During the appointment, Sally experienced her seizures and fell asleep after. 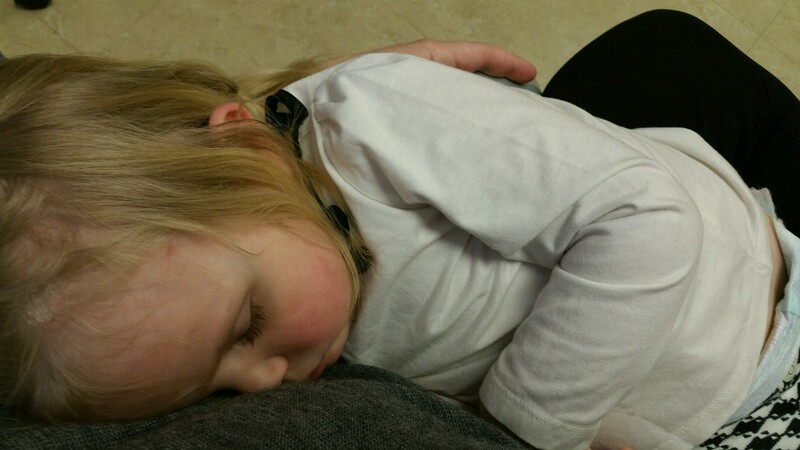 While at her appointment today, Sally had a seizure and fell asleep. Sally’s next CBC and bone marrow aspirate at Sloan Kettering is next week, her 9 month checkup post treatment. Overall the last few months have been as close to normal has we’ve had in years. We are grateful! We’re really looking forward to opening the summer cabana this weekend that the members of Breezy Point Surf Club were nice enough to donate to us at the end of last season. We appreciate all of the words and offers of support this week from friends and family as we begin to deal with this new challenge, it means the world to us. Please keep Sally in your thoughts and prayers. Oof. Big hugs to all of you. Praying for you all during this challenging time! I can’t get Sally off my mind ever since I read about her seizures. I think about all of you throughout the day…. and when I do I say a prayer. I hope this is something that will go away quickly so that Sally can get back to healing and growing. You know how much our family loves your family. We think you guys are awesome parents with incredible kids. We feel blessed to know you. Wishing the best for Sally and your family. I’m glad the summer is coming. The beach will provide some fun and laughter during this time of worry and concern. Sally is such a little trooper. I hope you all will be able to enjoy your summer. Much love and many prayers for the whole family. You are always in my prayers and heart. You are lucky to have parents so active in your care. Peace and blessings to all the family. You’re in our daily thoughts and prayers!!! We love Sweet Sally Sunshine and your amazing family. We will continue to say prayers for healing and strength for you all. You are all in my thoughts and prayers, always. Sally will overcome these episodes and respond well to treatment. You amaze me with your strength and fortitude. Sally is so blessed to have you both walking this journey with her. Prayers, prayers, prayers. I am heart broken to hear that Sally is having seizures. My older daughter is a stage IV NB survivor, dx in 1996. She was treated at MSK. My younger daughter was diagnosed with epilepsy almost 3 years ago. We are now on our 4th neurologist, still trying to find the right treatment. We were up at Cornell for over a year with a Dr. there. We left the there for several reasons, with the ultimate goal to help our daughter stop having seizures. After having been at MSK for so long, you expect that level of excellence for your child. We are in NJ, originally from Brooklyn. Please fell free to email me or pm me, I am happy to share with you. It is very hard to put this into words without sounding like one is worse than the other. Being a mom to a child with cancer and a mom to a child with epilepsy; when we walked into MSK they told me this is the plan and these are the likely results. We knew what we had to do and the rest would be out of our hands. Epilepsy is nothing like that. It is a lot of “let’s try this and see if it works”. Just like chemo drugs, these drugs come with side effects. It is a balancing act, one that we are still working very hard to achieve. Praying for your beautiful Sally. Always a new challenge but not having seen an update in a long time…Sally looks GREAT!!! She has grown by leaps and bounds and dare I say, looks healthy! I am sad to here Sally is experiencing seizures. She has been through so much. I have had seizures due to epilepsy since childhood. I had been seizure free for 30 years, until I started chemotherapy. Three years later I am still having seizures similar to Sally’s. I have learned to control them somewhat by removing myself from caotic situations. Maybe this can also help Sally. Sometimes they can be brought on by anxiety. My prayers are with Sally. Thinking of you guys always. Sally is in our prayers. Sweet Sally Sunshine!! I’m happy to see Sally enjoying some normal childhood activities especially those with her big brothers!! She is so adorable!! My brother has epilepsy so I know watching seizure activity is very scary especially if it’s your little girl!! She and your whole family has been through so much already!! I hope you find a doctor to help Sally!!! Enjoy your cabana at Breezy Point Surf Club! !As always your family remains in our prayers!! ?? So sorry to hear that Sally has another problem. I’ll make sure all the prayer groups that remember Sally and her family increase their prayers. God bless all of you – the strongest people I know. Love & prayers are with you. May God bless you all. Always thinking of Sally and your family. Continued prayers for all. As for the seizures my son had febrile seizures when he was little so I can somewhat relate. I don't know how many neurologists we saw nor how many meds we tried but it is by trial and error as one other parent said. I will pray that you find the right pediatric neurologist for your sweet Sally sunshine and for the right meds to help control her seizures. Some of the meds did make my son so tired and what I learned is that the dose was too strong and needed to be lowered. The Epilepsy foundation provided me with some resources and word of mouth from other parents. May God continue to watch over you all as you face this challenging time. Dear Matt and Nicole, thank you for the updates on Sally. You are incredible parents. May God bless you in the New Year!.